This is an everyday spice, which puts some colouring on most lunch tables. The taste and scent of the salt reminds you of freshly smoked mackrel. 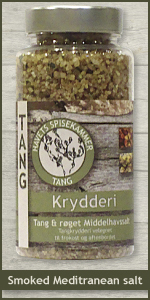 We have added the nutritious dried seaweed to make the spice more rounded. The bottle contains 130 gr.